The Illinois General Assembly passed several laws that could dramatically affect animal control agencies and programs. We’ve consolidated those changes below. This is provided for information use only and agencies should confirm with their legal counsel how the new sections may apply to them. You can view the entire bills at www.ilga.gov. Haven’t entered a witness slip before? See the bottom of the page for instructions. Don’t know who your legislator is? Go to www.ilga.gov and click on Legislator Lookup. Sec. 2.18b. Reckless dog owner. “Reckless dog owner” means a person who owns a dog that while anywhere other than upon the property of the owner, and without justification, kills another dog that results in that dog being deemed a dangerous dog under Section 15.1 of this Act and who knowingly allows the dog to violate Section 9 of this Act on 2 occasions within 12 months of the incident for which the dog was deemed dangerous or is involved in another incident that results in the dog being deemed dangerous on a second occasion within 24 months of the original dangerous determination. (a) The Administrator, State’s Attorney, Director, or any citizen may file a complaint in circuit court to determine whether a person is a reckless dog owner. 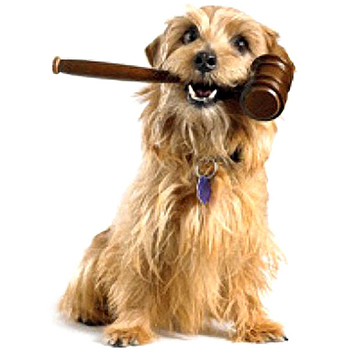 If an owner is determined to be a reckless dog owner by clear and convincing evidence, the court shall order the immediate impoundment and forfeiture of all dogs the reckless dog owner has a property right in. Forfeiture may be to any licensed shelter, rescue, or sanctuary. The court shall further prohibit the property right ownership of a dog by the person determined to be a reckless dog owner for a period of at least 12 months, but not more than 36 months for the first reckless dog owner determination. (a-5) A dog’s history during ownership by a person found to be a reckless dog owner shall not be considered conclusive of the dog’s temperament and qualification for adoption or transfer. The dog’s temperament shall be independently evaluated by a person qualified to conduct behavioral assessments and, if deemed adoptable, the receiving facility shall make a reasonable attempt to place the dog in another home, transfer the dog to rescue, or place the dog in a sanctuary. (b) A person who refuses to forfeit a dog under this Section is a violation which carries a public safety fine of $500 for each dog to be deposited into the Pet Population Control Fund. Each day a person fails to comply with forfeiture or prohibition ordered under this Section shall constitute a separate offense. “Foster home” means an entity that accepts the responsibility for stewardship of animals that are the obligation of an animal shelter or animal control facility, not to exceed 4 animals at any given time. Permits to operate as a “foster home” shall be issued through the animal shelter or animal control facility. 225 ILCS 605/3.4 – Transfer between shelters. or out-of-State animal control facility or animal shelter who is transferring the animal out of the State of Illinois. Sec. 3.6 (c) If no transfer can occur, the animal shelter shall make every reasonable attempt to contact the owner, agent, or caretaker as soon as possible. The animal shelter shall give notice of not less than 7 business days to the owner, agent, or caretaker prior to disposal of the animal. The notice shall be mailed to the last known address of the owner, agent, or caretaker. Testimony of the animal shelter, or its authorized agent, who mails the notice shall be evidence of the receipt of the notice by the owner, agent, or caretaker of the animal. A mailed notice shall remain the primary means of owner, agent, or caretaker contact; however, the animal shelter shall also attempt to contact the owner, agent, or caretaker by any other contact information, such as by telephone or email address, provided by the microchip or other method of identification found on the dog or cat. If the dog or cat has been microchipped and the primary contact listed by the chip manufacturer cannot be located or refuses to reclaim the dog or cat, an attempt shall be made to contact any secondary contacts listed by the chip manufacturer or the purchaser of the microchip if the purchaser is a nonprofit organization, animal shelter, animal control facility, pet store, breeder, or veterinary office prior to adoption, transfer, or euthanization. Prior to transferring any stray dog or cat to another humane shelter, pet store, rescue group, or euthanization, the dog or cat shall be scanned again for the presence of a microchip and examined for other means of identification. If a second scan provides the same identifying information as the initial intake scan and the owner, agent, or caretaker has not been located or refuses to reclaim the dog or cat, the animal shelter may proceed with adoption, transfer, or euthanization. 225 ILCS 605/7 – Applications for renewal licenses. (J) ending inventory; shelter count at end of the last day of the year. Enter a Witness Slip – It’s Easy! Enter your bill number to determine which committee it has been assigned. Go back to Home page and click on GA Dashboard and follow these steps.